Sequoyah National Golf Course located only one hour from Wears Valley in Cherokee NC. Image courtesy of www.sequoyahnational.com. Golf courses in the Smoky Mountain region are not only beautifully landscaped, the backdrops of the Smoky Mountain enhance a golfer's experience in the great outdoors. Bent Creek Golf course, a par 72 course, was designed by three-time Masters and British Open Championship Winner Gary Player. The front nine hugs the valley floor while the back nine offers a challenging mountain course. A beautiful sparkling mountain stream runs throughout the entire course making for a breathtaking contrast between water and Great Smoky Mountains National Park. 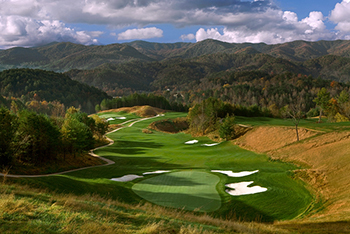 Acclaimed as one of the most picturesque courses in America with breathtaking views of the Great Smoky Mountains. At Laurel Valley Golf course you will find picturesque views and natural beauty. This eighteen-hole golf course offers a clubhouse and fitness/swim center. It isn't unusual to spot a bear or two when golfing. Located only one hour from Wears Valley (close to Harrah's Cherokee Casino), Sequoyah National Golf Club is nestled among the oak, fir and flowered valleys in the heart of the Great Smoky Mountains. Owned by the Eastern Band of the Cherokee, this Robert Trent Jones II design offers golfers an idyllic 18 hole journey, filled with scenic vistas, beautiful landscapes and challenging golf. The Sevierville Golf Club offers the services, amenities, and presentation of a high-quality private club on a daily fee basis. There are two 18-hole championship courses: The Highlands, a par 70 that winds through lush rolling hills and fresh water mountain ponds and The River, a par 72 plays along and across the Little Pigeon River.